At bonkers.ie we’re on a mission to save you money. We make it quick and easy to compare prices and switch across a range of energy, broadband, banking and insurance providers and our aim is that you should never overpay on a bill again. With that in mind, we’ve found seven ways to save you potentially thousands of euros on your bills every year! Think you can’t save money on your bills? Think again. At bonkers.ie we know that switching saves. Yet every year people pay more than they need to by not switching. So here’s our guide on how to compare prices, switch provider and save big on your bills with bonkers.ie. Energy prices in Ireland are rising so it’s more important than ever that you’re on the best rate. And the good news is that you could save around €300 a year just by switching your gas and electricity provider. That’s because most of Ireland’s energy suppliers offer discounted rates to brand new customers as a sign-up incentive. However, these deals usually expire after 12 months. At this stage, if you don’t switch, your supplier will revert your plan to standard pricing and you’ll pay more for the exact same service. Switching gas and electricity supplier is super quick and easy and everything can be done online in literally the space of a few minutes on bonkers.ie. All you need to switch is your GPRN and MPRN (which can be found on your gas and electricity bills) and a recent meter reading. And if you can’t find the key to open your meter box, let us know and we’ll send one out to you. Around 27,000 people switch electricity supplier, and 11,000 switch gas supplier, every month, so why not join them! It's quick and easy to switch and can all be done online in a few minutes. With the average monthly bill close to €100, staying connected online and up-to-date with the latest TV shows is by no means cheap. However there are huge savings to be made by shopping around and switching every few years. That’s because broadband, phone and TV providers save their best deals for brand new customers and regularly offer half-price incentives for six months or more to entice customers to switch. The good news is that bonkers.ie lets you easily compare speeds, prices, channels and offers from all of Ireland’s main providers. You can also search for broadband-only deals or packages with phone and TV, whatever best fits your needs. And once you’ve found the right deal for you, you can place your order on our site in just minutes. 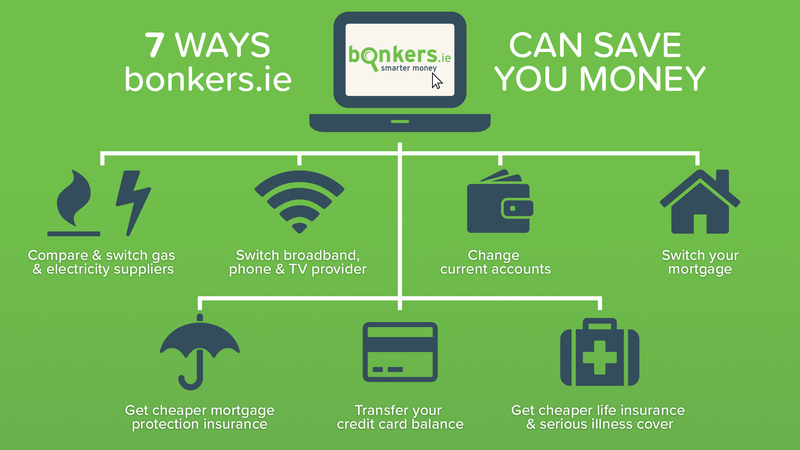 So if you’ve been with your current provider for more than a year or two, see what great offers are out there right now on bonkers.ie and put some more money back into your pocket. Think all the banks are the same? Think again. Some banks will charge you as much as 35 cent every time you withdraw cash from an ATM and 20c for every chip and pin transaction, while others will charge you nothing. Equally, different banks offer different extras such as mobile payments (like Apple Pay and Google Pay) or access to emergency cash. Our current account comparison service lets you easily compare the different account features and charges from all of Ireland’s banks and will quickly show you what your monthly fees would be. Right now you could save over €145 a year by switching to the bank with the lowest fees. Worried about the hassle of switching? Rest easy - the Central Bank has in place a code of conduct for switching to make the process as easy as possible which all banks must comply with. Your mortgage is likely to be your biggest monthly expense for years so this is one bill that you don't want to overpay on! Our mortgage calculator and comparison service lets you easily compare interest rates, offers and cashback incentives from all of Ireland’s mortgage lenders and will quickly show you what your monthly repayments would be. And once you’ve found the right deal for you, we can arrange a callback from one of our qualified mortgage advisors who can arrange your new mortgage. So whether you’re a first-time buyer, a home mover, or looking to switch mortgage, we’ll take the hard work out of finding the best deal and could help you save hundreds of euro a month on your repayments. Right now a mortgage holder who’s on a standard variable rate of 4.5% for a €250,000 mortgage could save almost €300 a month by switching to the best rate. It's a no brainer! Mortgage protection is compulsory for mortgage holders in Ireland, but many people are paying more than they have to. And remember, you don’t need to take out insurance with the same bank that gave you your mortgage! bonkers.ie lets you easily compare prices from Ireland’s main insurance providers. Whether you’d like a single policy, a joint policy, or a policy with added benefits, we’ll search a wide range of policies across multiple insurers and produce a quote for you in just seconds. And because your policy must run for the length of your mortgage, even a small saving of €5 or €10 a month would still add up to almost €2,500 over the lifetime of a 20-year mortgage. Not bad! Most credit card providers have special introductory offers for those looking to switch, such as 0% interest on balance transfers for the first 6 to 12 months, which can be a great way to help you clear your existing credit card debt faster. So check out our credit card comparison service. It lets you easily compare interest rates, balance transfer options, and card features from Ireland’s main credit card providers and will quickly show you where you can find the lowest interest rate and best switching deals. Having adequate life and serious illness cover is all part of good financial planning. But that doesn't mean you have to pay more than you need to! So if you’re looking to save money on your insurance costs, we can help. Our comparison service lets you quickly and easily compare prices from Ireland’s main insurance providers. And once you’ve found the right policy for you, you can apply online on our site in just minutes. The easiest money you’ll ever earn is the money that you’ve saved as they say. So start switching today and enjoy spending those new found savings! It's easy. It's free. It's bonkers.ie!